Drumset Socks! – Who would’ve thought? 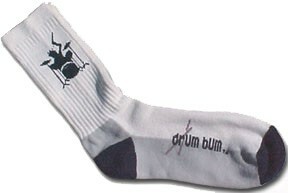 DRUM BUM is proud to introduce the world’s first socks for drummers! This “thick” high-quality sock is great for athletic and casual wear. Wear them in the gym or around town. Professionally embroidered by one of the industry’s top custom sock makers, this comfortable ribbed sock is sure to attract a lot of attention. These drummer socks are MADE IN THE USA! 75% Hi-Bulk Acrylic, 25% Stretch Nylon Crew Socks. Size 10-13. One pair. A DRUM BUM Exclusive! Unique Drums Clothes at DRUM BUM!